MORDECHAI VILOZNY, the father, is a Holocaust survivor visiting Poland, where he lost his parents. He has returned for the first time,after fifty years, to the landmarks of his childhood in Poland and he follows his father's trail to Auschwitz. MORDECHAI has never told his children about his experience during WW II; his silence resulted in alienation from his first born SHMUEL. Inspite of the silence, the trauma was still passed on to SHMUEL. 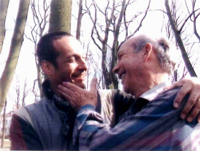 Surprisingly, through this journey, father and son free themselves from the traumas; the father from the trauma of the Holocaust, the son from the shadow of father's unknown trauma. Accusations are hurled and answers are given. They laugh together for the first time in many years, they hug, they kiss and they cry, finally understanding one another.